When work began on JSMESS a couple years ago, I knew that it was probably somewhat easy to do all this conversion work for MAME (the arcade side) as it was for MESS (the computer and console side). I specifically chose not to, because I was not interested in a pile of work just to make another game platform. This was about software history, and it’s not that hard to get MAME up and running for the game or games you want to play. Over the next few years, we got JSMESS working, and working pretty darn well – in a lot of cases, you can boot into a wide range of computers in your browser and it’s working great. There’s hiccups here and there, and we have work left to clean it up, but on the whole.. the proof exists. You can browse the historical software collection and the software library and wow, thousands of programs instantly there! So, earlier this year, I decided to futz around with our build environment (which, it must be absolutely stressed, the other JSMESS team members built, not me), just to ask the question, “And how hard would it be to build arcade games, anyway?“. It turned out to be easy. Very, very easy. Months of testing, refinement, improvements and efforts, and this week I have announced the result: The Internet Arcade. So then begins the question that I ask myself more and more in this endeavor: Now What? And my hope is that a handful, a probably tiny percentage, will begin plotting out ways to use this stuff in research, in writing, and remixing these old games into understanding their contexts. Time will tell. Until then, game is on. Great stuff! Thank you, and everyone else who made it possible, SO MUCH for putting this together. I would love to see some kind of (crowdsourced? crowd moderated?) tagging system for the game library, that can be used to generate relationships between games. I’d LOVE it if I could search by taxonomy. “Give me all Konami games from 1986” or “Games that were worked on by [favorite designer]” or “Games influenced by Pac Man” or “Games with vertical scrolling, ordered by release date” or “Games with jumping mechanics” or pretty much anything else I can imagine to search by. I thank you from the bottom of my heart for making this. Really really awesome work. Great job! Knowledge for next generations. Not getting any response from my keyboard on anything I’ve tried yet…is there a recommended GamePad to use? Awesome! Is there a way to change the keys? On ubuntu pressing the ALT key repetitively open the contextual options for your browser. To redefine keys within MAME (or to simply look at the current controls) simply press the Tab key. 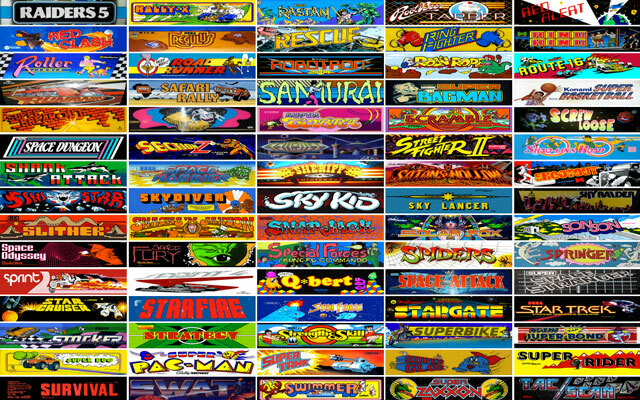 I just found the internet arcade, great site, lots of good games. But … how do I start a game ?? I choose for example Indiana Jones Temple of Doom … and then what ? I have to download the game ? I have to start is clicking some button ? Thanks for all the work! I think it’s important to archive these oldies. Now if you could only archive old board games and make them playable. Who says the world hasn’t gotten better? Now I can play *all* the arcade games I ever wanted to when I was 10. All without quarters, or having to beg my parents to drive me to the arcade! A part of my childhood has been returned to me, improved. Thanks! Hi Jason- great job with this! I’m curious as to how you came up with the 900 total, since I did a rough count and came up with 370 games (give or take a handful) on the main page. Are there more video games on another page? Are you including the console games elsewhere in the archive? I want to say thank you for doing this. It’s incredible that you’re keeping history alive in such an accessible way and that everyone with access to the web can enjoy it. The work that went into it must have been immense. As a game audio specialist myself I’d like to offer any assistance I can with making sure the audio is just as functional as the visuals. I realize MAME drivers sometimes leave a lot to be desired in the sound department. But where do we start to get it 100%?